BullGuard antivirus is offering best protection against keyloggers, worms, threats, viruses, Trojan, spyware, adware and malware based infected scripts. A powerful spam filtering engine was added recently that will permanently monitor web and email. It gives real-time protection to do block any malicious and suspicious installation. USB flash drives and internet is a big source of infecting user computer during past few years. A 24/7 live support is also available for trial and premium users of BullGuard. The installation of this powerful antivirus software will automatically detect any previous security or firewall installed program. It will show a dialog box to uninstall previous antivirus program to prevent conflict between 2 or more products. The setup will extract latest virus definition updates but you should have good network connection to stay live with updates. Advance scanning engine is another perfect ability used to eliminate virus or Trojans from internal and external media. Many software installations will install 3rd party apps and add-ons without user permission that may harm your privacy. Intuitive Interface: A simple and user friendly interface will always help it’s users to operate several functions of target program. BullGuard has light gray color scheme where everything is easily readable and doesn’t shows anytype of complexity. Faster Speed: As we know, many of antivirus and anti-spyware programs are heavy and loaded with strong engines. BullGuard antivirus is smart, powerful and even effective for Pentium III computers. This is the reason it works faster then ever before because of upgradation in it’s algorithm. BullGuard Backup: A backup feature for premium subscription will help its consumers to take a backup of important data and information. A hardware or OS loss may harm personal data so BullGuard backup service will rescue it successfully via cloud hosting. Message Center: A notification center will always show something special about system protection. It may display update virus definition, end of subscription date, scan system drives and more. 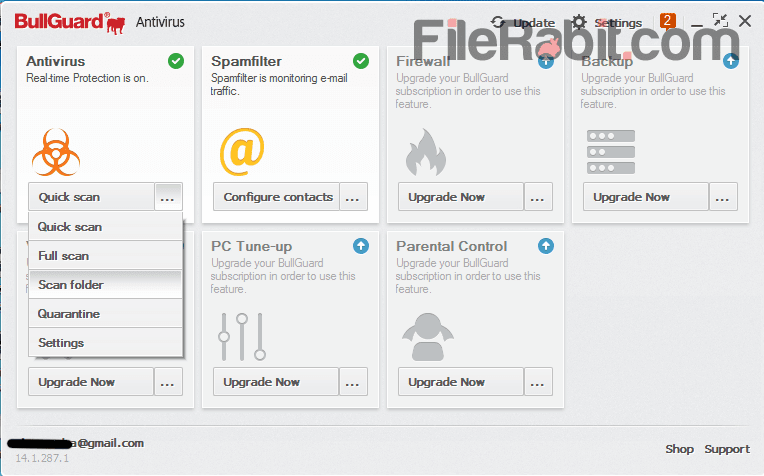 You are recommended to visit the message center on daily basis so you will stay live with BullGuard antivirus. Spam Filter: A powerful web, email scam and phishing filtration advantage will monitor websites, email inbox, junk, spam and other firewall activities. It will take any further action against malicious or suspicious activities whenever BullGuard finds it.